This vest was handspun on a drop spindle and handwoven on a simple wooden loom, using Tibetan sheep wool. 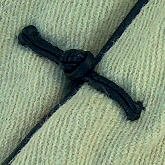 It is a tweed weave which has been felted with hot water. The cloth is dense and very warm. 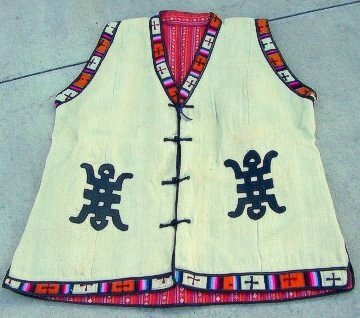 This vest has leather applique and traditional cross-pattered “chook” edging. 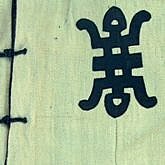 It has a soft cotton lining and was spun, woven and tailored in Dranggu, Hor, Kham.